Q: I see that you used local sand to build the Glorieta project. My son and I are planning a similar project, our site soil is sandy as well. Were you moistening the sand in those bags or just tamping the dry sand? Has there been any structural failure due to the sand shifting? A: We just filled the bags with the dry sand; I don't think moistening it would have made any difference since it is a rather fine and slippery sand. Had there been any clay to speak of in the soil, moistening it may have been effective in getting it to solidify some. Since the structure had perfectly vertical walls there was no problem with the bags wanting to shift, and once they got covered with chicken wire and stucco the structure has been quite stable. Q: I am with the faculty of fine arts, Alexandria University, Egypt. We need help with our earthbag building. We are having problems with the dome part. It is collapsing and we cannot keep this from happening. We have bags of cloth, with a diameter of 30 cm, and are using dry, pure, yellow sand. The students are so happy to build with the sandbags, me too...we need to continue. A: I am so sorry to hear about your problems with building your earthbag dome. I suspect that your main problem is the sand you are using to fill the bags. I also had a major problem with the first earthbag dome that I tried to make; it also collapsed because I was filling the bags with pure dry sand. I suspect that some kinds of sand might work for this, but the sand that I used (and apparently you as well) is too "slippery" to stay in place, especially when the dome begins to incline more and the force of gravity pulls on the sand. With vertical walls, it would probably be fine, but not with inclined walls. What happens is that some kinds of sand do not pack firmly together, and instead will easily shift position within the bag. The solution would be to either find some other soil to fill the bags, or at least to add some clay (10-30%) to the sand that you have. Another solution would be to stabilize the sand with some Portland cement, or possibly some lime and dampen the mix before bagging it. I know that Nader Khalili at one time said that the bags could be filled with sand, but experience has shown that this doesn't always work. In fact, he eventually resorted to using a pure adobe soil for his "superadobe" sandbag works, and stopped relying on the bags to remain a structural part of the building. Also, from the picture I can see that the bags you are using are fairly small in radius, which would give them more a tendency to roll off as you build, especially given that I see no barbed wire placed between the courses. It appears that the bags weren't tamped very much as they were put up. All of these factors might also have contributed to your collapses. Q: My wife and myself are considering building a small house in a desert Oasis, in Egypt. As you may know, the main material available over there, besides Palm trees and salt blocks, is ...sand, sand, and sand! I do not know what are the limitations, drawbacks or advantages of using sand instead of another non-available material. Do you think the result (stability, thermal isolation, humidity, long lasting, etc..) could be positive ? A: I have had some experience building an earthbag structure with sand. My first experimental building was done this way, and unfortunately it didn't turn out too well. The problem was that the sand where I was building (near the Great Sand Dunes National Park in Colorado, USA) was a very fine, rather spherical sand that didn't want to pack into a solid form in the bags. You might say that it was a "shape shifter," so that when I was up to about two meters high with this little dome, the wall simply collapsed. I rebuilt the dome using some local crushed volcanic stone. This doesn't mean that you can't use the sand that is available to you; it just means that you need to be careful about using it. Some sorts of sand, like a sharper river sand, does pack well. Even if your sand is more like what I tried to use, you can stabilize it in various ways, through either adding some cement and wetting it before you fill the bags, or possibly adding some clay to the mix. Lime is another possible stabilizer. In any case, I suggest that you do some experiments to see what works best, before committing to a large project like a house. The real drawback we find with sandbags is the necessity of having at least 3, 4 or 5 persons around working on the project. Regardless of budget (and bearing in mind that red bricks are quite cheap in Egypt), one positive point about using bricks (clay, mix, cob etc..) is that one can still work alone, or two people can work on different parts/areas. I built most of my earthbag house in Colorado all by myself, so you don't necessarily need a crew to do this. Q: I know a missionary in Niger that is interest in earthbag building, but he is concerned that the local sand is too fine, thin, and dry for that system. A: It might be that the local sand does not pack well enough into a firm block to be good fill material, but this can be amended with some clay or even cement or lime and dampened to help it solidify some. Q: We recently purchased a lot in Southern Baja, Mexico and are very interested in building a small vertical wall building with earthbags. Around 200 square feet. The soil in the area seems to be mostly a sandy dirt, pretty fine in texture, it is basically desert, very dry fine soil. Do you think this would be acceptable for this type of structure? A: If you make the building circular, or at least with curved walls, then I would say that you could likely use your fine sandy soil. I did this for a circular structure once, about a decade ago, and the building is still standing. 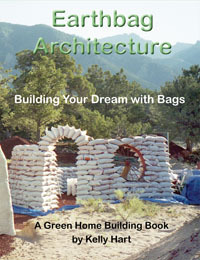 See earthbagbuilding.com. Or, if you stabilize the sand with some added clay, Portland cement, or lime, then you can build most any shape. Q: I would like to build using the earthbag technique and I would like to know if it is possible to use the beach sand that is found locally. A: It is always better to have some clay in with the sand to keep it from shifting over time, but yes you can use the sand if you only build with vertical walls, especially curved ones, and use barbed wire between the bags. I would not recommend using sand alone with a dome. I used sand to build the Glorieta. It is a good idea to have a strong reinforced concrete bond beam at the top of the wall, and if there are straight sections of walls they should be well buttressed. Q: I live in Ecuador and I need to build a house close to the beach. I am going to live there. I would like to use the sand I have on the beach, but I really do not know how to do this. I found some explanations but I do not feel secure to start my own project. Could you give some ideas to build this house? A: The beach sand can be used by itself if the walls are vertical and well buttressed, but it is usually better to mix some clay with the sand to make it hold together better. Q: How does high salinity beach sugar sand work in earthbag construction? A: Fine, sugary sand is a shape shifter and can only be used for earthbag construct in specialized cases where deformation is unlikely to occur. It is usually better to use a sand/clay mix (70/30 ratio) for construction, unless you want to stabilize the sand with cement or lime. Q: Do you know why a wall made of compacted sandbags only (i.e. without cement) and meshed and plastered afterwards gets so hard overtime? It is something that surprises me but don't know why and how this works. I had the chance to feel one and I had the impression that it felt even harder than a brick-wall. A: Some sands do compact better than others, especially the sharper sand that is favored for cement work. But most earthbags are actually filled with a mixture of sand and clay (2:1 ratio) which does set up up very hard, like adobe blocks, rammed earth, or cob walls.